Dressing for back to school can be tricky with the fluctuating temperatures, but as long as you have some great pieces to layer it’s all good! Kristin is a boho-style girl with flame-red color on the ends of her hair, so putting her in a casual dress that featured tie dye on the bodice and elasticized waistband, along with a chambray skirt from Say What, was an easy choice. We layered the dress over another pink t-shirt from Mossimo for added style, and to make it less of a sundress and even more appropriate for school. We jazzed it up with some cool accessories like the gray spiked bracelets and the delicate hippie- style necklace, and used her own white sandals to keep it fun. The big idea here is to use a dressier blazer in gray from Last Kiss to give our other pieces not only more style, but some substance as well. Blazers make great transitional jackets in early fall and spring, too! Kristin is ready to “school” her fellow classmates in the elements of style! Nothing says back-to-school cool like a casual, layered look like the one our model Ian, (IJ) is sporting this month. All you need to put it all together are a few key items. We started with a great alternative to jeans for everyday wear. These gray-and-white pinstripe chinos from Gap are perfect for a sophisticated, yet easy look. 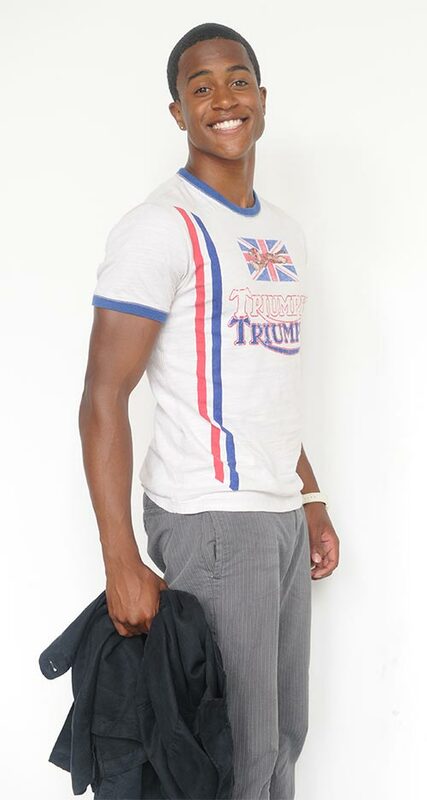 With those as a base, we added an all-important graphic t-shirt with a red-white-and-blue Triumph motorcycle design by Lucky Brand. This creates a great contrast for the black button down long-sleeve shirt we used as an alternative to a denim jacket. To make everything “pop” a little more we added a white watch from Xhileration, as well as some always cool slip-on deck-style shoes from Vans.This look is polished enough for day tripping around campus, but casual enough for a game of basketball on the court as well. IJ is all smiles because he knows he looks good!